For a show in which a quarter of the cast is permanently plugged into the mains, Spillikin must have one of the biggest, warmest hearts on the Fringe. With an on-stage robot as one of its stars, it combines technical trickery with a subtle story of love in the twilight years. Sally and Raymond first meet as awkward teenagers – he a technology-obsessed geek, she a brittle flirt who covers up her insecurities with venomous sarcasm. During their long and not uneventful marriage, Raymond constructs a robot – programmed with his own personality and memories – to care for his ageing wife when he’s no longer around. But when her increasing Alzheimer’s leads Sally to confuse robot Raymond with the (now deceased) real thing, things get complicated. Writer-director Jon Welch and Cornish company Pipeline Theatre have created a powerful, moving love story from the unlikely collision of dementia and artificial intelligence. Welch might shy away from asking ethical questions about robots replacing humans in intimate relationships, or indeed about their limitations in dementia care, but he focuses with touching sincerity on the fragility of human hopes and disappointments in long-term love. Yet the idea behind this play is reflecting events in real life, as computer science is beginning to experiment with the kind of programming that once belonged in science-fiction. Robothespian, created by robotics firm Engineered Arts, is a permanent presence on stage – and a good actor, too, with impeccable timing and a nice range of facial expressions. Yet the human actors are not overshadowed by the machine: Helen Ryan gives a superbly thoughtful, powerful performance as the increasingly confused Sally, and Michael Tonkin-Jones and Anna Munden play the young lovers with nicely toe-curling awkwardness. While Spillikin brings up complex ideas about the nature of being, and the potential of artificial intelligence, it’s a delightful show – and one whose technical accomplishments are matched by its compassion. Pleasance Dome, 556 6550, until 31 Aug (not 24), 5.10pm, £7.50–£10 (£6.50–£9). 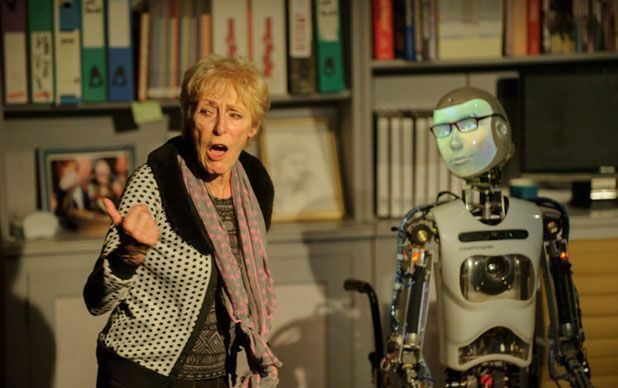 Pipeline Theatre's production about a woman with Alzheimer's and a robot version of her husband.